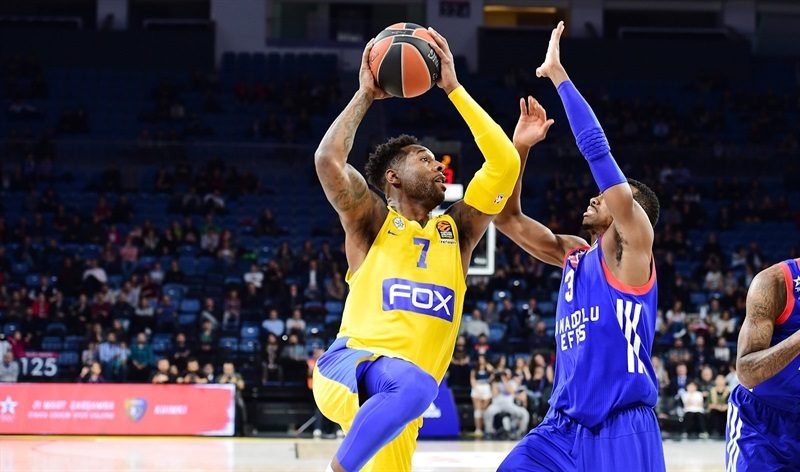 Maccabi FOX Tel Aviv shattered its season-high with 15 three-pointers, pulled down 16 offensive boards and never trailed in the second half in an important 81-94 road win at Anadolu Efes Istanbul on Thursday. 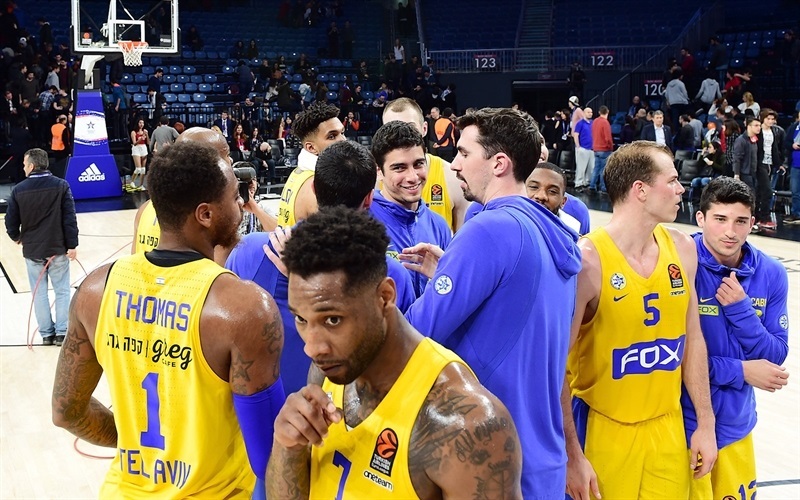 Maccabi improved to 13-12 record to remain in sole possession of eighth place in the standings, while last-place Efes dropped to 6-19 and was mathematically eliminated from playoff contention. 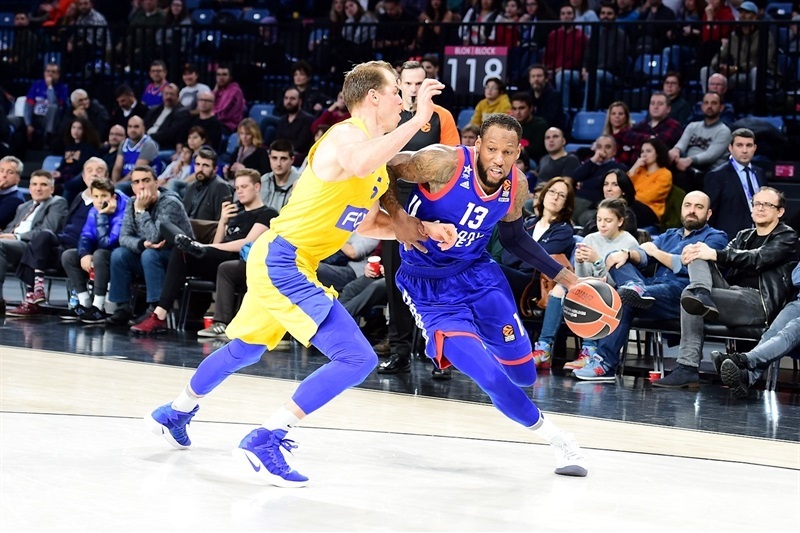 Maccabi took the lead for good with a 0-11 second-quarter run during which Michael Roll hit 3 triples and then used three-pointers from Pierre Jackson and DeAndre Kane in the third and fourth quarter to pull away and cruise to victory. Jackson finished with 18 points on 5-for-8 three-point shooting, while Roll had 16 points on 4-of-6 three-point shooting and dished 7 assists. Artsiom Parakhouski scored 14, DeShaun Thomas had 12 points, and DeAndre Kane had an all-round performance of 9 points, 9 rebounds – 7 coming on the offensive glass, and 6 assists. 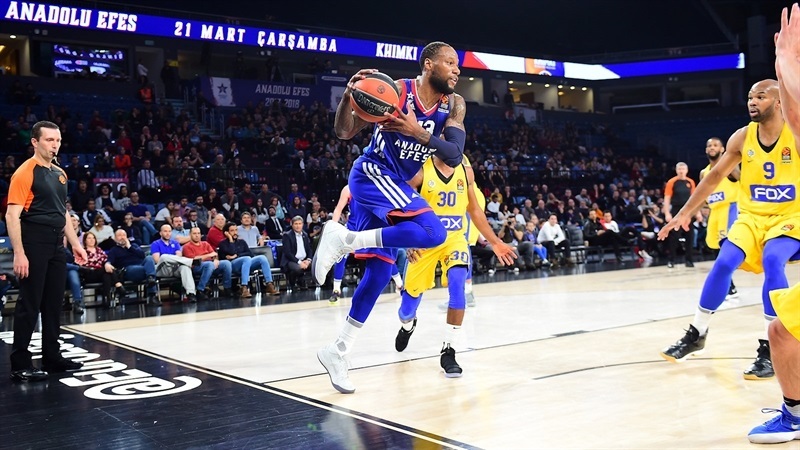 Sonny Weems paced Efes against his former team with 21 points and 6 assists. Bryant Dunston scored 16, Toney Douglas scored 14, while Errick McCollum netted 13 in the losing effort. 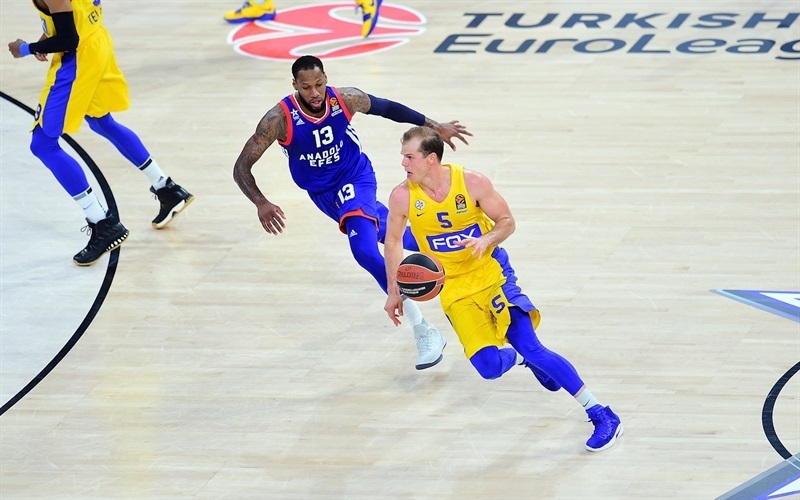 Parakhouski scored twice from close range, and Jackson hit twice from long range for Maccabi which took an 8-12 lead, but Weems also had couple triples early for Efes and already tallied 10 points as the hosts countered to go up 16-12. 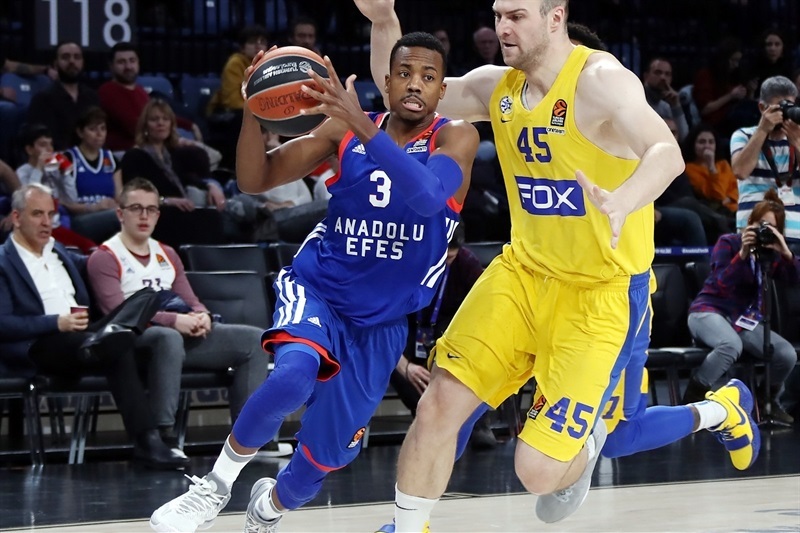 Norris Cole knocked down a triple to snap the hosts’ run and the game turned into a run-and-gun show as McCollum hit his only triple of the night for Efes before Thomas’s transition triple made it 21-20 after 10 minutes. The teams kept the pace up, and Maccabi went in front as John DiBartolomeo strung together 5 points to put the visitors up 23-25. Birkan Batuk hit a three on one end, but Roll caught fire on the other, scoring from downtown to fuel a 0-11 run for Maccabi to go in front 28-36. 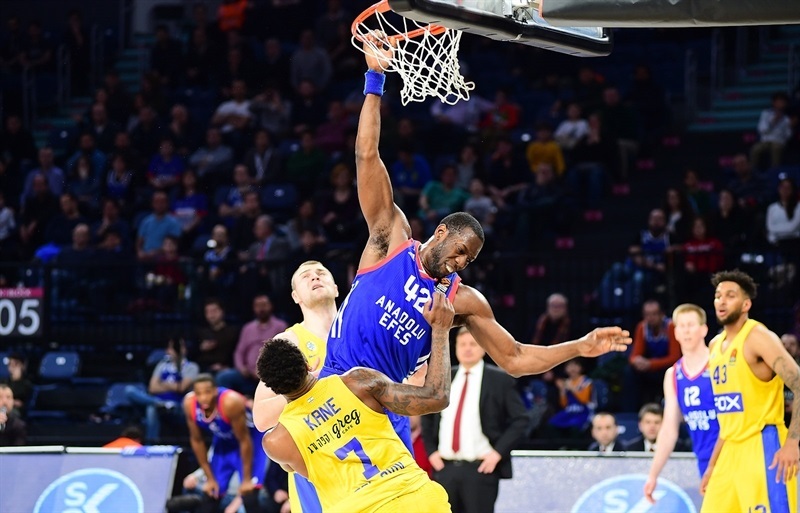 Efes answered with a 9-2 run, during which Dunston had a three-point play and Brock Motum scored twice, before Jackson and Weems each hit one more triple in the final minute of the half. Maccabi went into halftime with a 42-43 advantage. Roll opened the third quarter with a triple, sparking a 0-9 run during to which Jonah Bolden and Parakhouski scored fastbreak layups for a 42-51 lead. 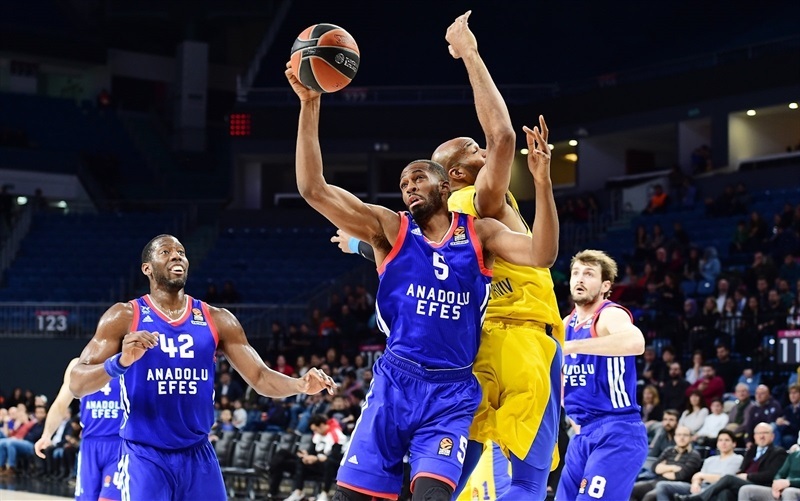 Efes was almost three minutes without a basket before Weems hit a floater and Dunston added a three-point play to make it 49-52. But Jackson knocked down a pair of second-chance triples for Maccabi and Kane hit one from long range as the visitors opened a double-digit lead, 53-63. 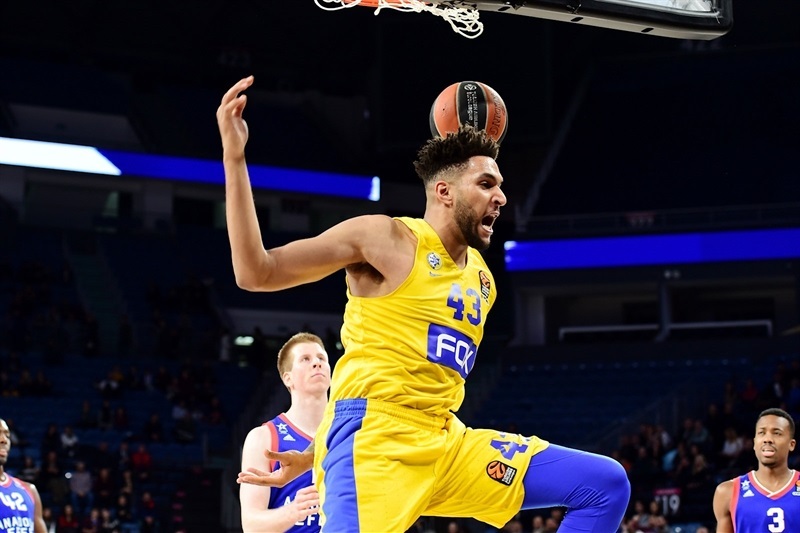 Efes answered with a 7-0 run, with Douglas knocking down a triple and a long jumper, but a pair of Cole baskets at the end of the third and two Parakhouski buckets to open the fourth gave Maccabi a 62-71 advantage. 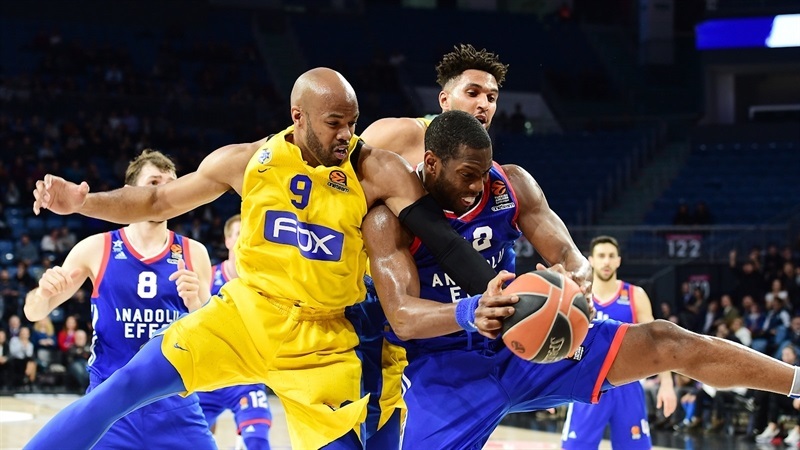 Douglas had a three-point play for Efes, but Kane nailed a corner triple before Alex Tyus scored twice inside, including a basket-plus-foul that helped Maccabi lead 69-81 with 5:20 minutes to go. Tyus, Parakhouski and Roll kept the margin in the double digits, and Maccabi comfortably closed out the game.
" I think physical they beat us. Under the boards they made 16 offensive rebounds, and we have 18 defensive rebounds. After every shot, 50 percent of the time they got a second chance, and many times after that they hit triples. 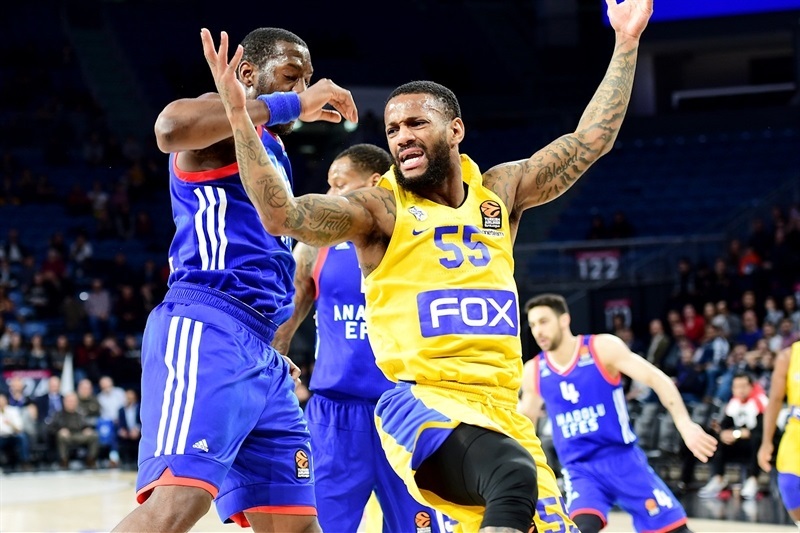 It is the first time this season Maccabi shot 15 triples on 62%. We tried to play our game on offense; McCollum missed a lot of his shots, but our offense was not too much of a problem. The problem was in defense, each quarter they scored more than 20 points, and broke the game open scoring 27 points in the fourth. 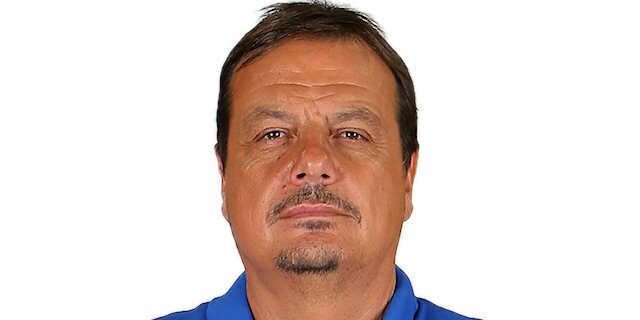 They beat us on defense and rebounds, and this is the result of the game, and for a reason they are in the eighth place and we are in the last place in the EuroLeague." 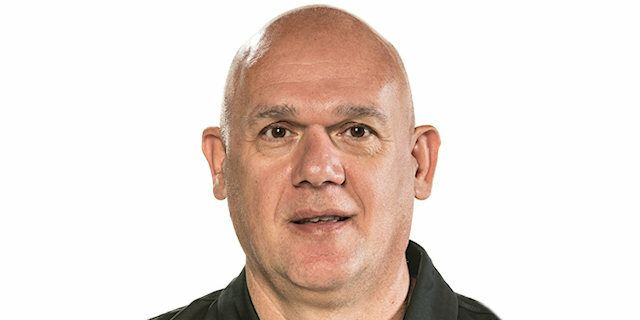 "We played a better game, especially making 15 threes and shooting with 62%. It looks like we did to them exactly what they did to us in Tel Aviv, making crazy threes. 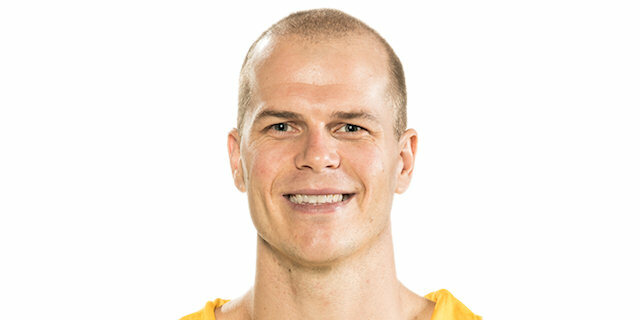 But also, I want to congratulate my team on the effort, because lately we did not play good basketball. You know how important this win is in the battle for the playoff." "It was absolutely a huge win for us. We really needed this win after a couple of losses in a row. We came here focused, tried to win with effort and 50-50 balls, and shot it well today. That was good. We have so much talent. When we share the ball it is really hard to stop us. Everybody is clicking out there, and that was also key for us. Now, we got a do a lot of resting and recovering. It’s been a long season. We got to stick it out and make this push for the playoffs."